Find a final solution to your, and your loved ones, health problems: physical (cure cancer and other forms of major illnesses, stay at your best and much more...) or mental (end depression or any other form of mental illness, suppress addiction and much more). Health Problems There are 2 products. 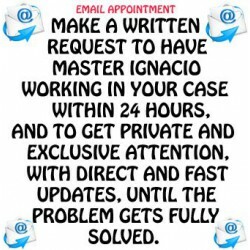 Master Ignacio is a very powerful healer who has treated countless numbers of people around the world after conventional medicine failed to cure the patient. 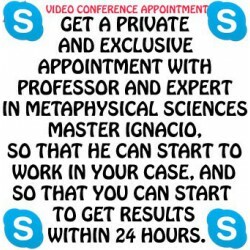 Get a Skype appointment today and start getting results within 24 hours after he begins to work in your case.